The original TVR Typhon sports car concept was for a supercharged, street legal sports car, with a carbon fibre body. Initially, the Typhon began life as the TVR Tuscan R, a two seater, composite bodied race/road car, which was presented at the 2000 NEC Motor Show in Birmingham. When TVR set about building the two road going prototypes, the title of the project was altered soon after the cars had been constructed. Originally, both cars were classified as Tuscan R's. However, the FIA rules for Le Mans stipulated that there had to be two models. Therefore, in 2002, one of the cars was rebranded as the T400R, with a 4 litre unit developing 400 bhp, and the other car as the T440R, sporting a 4.2 litre engine developing 440 bhp, both with a standard six speed gearbox. The T440R, with a Le Mans specification, was entered in the Le Mans during the years 2003 to 2005. On the other hand T400R's, with a slightly detuned engine, were entered in British and International GT events over subsequent years, and one road going T400 was built. The carbon fibre body of the Tuscan was exactly the same weight as the T440R Le Mans cars. In late 2003, TVR made public the creation of the Typhon, whose initial project name was designated the T550R. The Typhon would be a supercharged 4.2 litre T440, with larger brakes, and the option of TVR's own race style sequential gearbox, instead of the standard 5 speed unit. Shortly afterwards, the T400R designation was no longer used, since the Typhon would now have the two model lineup (Typhon and T440R) as laid down by the FIA. Ultimately, TVR delivered the only Typhon T440 to the customer. Between 2000 and 2004, TVR built 7 road cars as well as 7 race cars, consisting of 3 Tuscan R's and 4 T400R's. Only one of the T400R's was actually sold. The TVR Typhon sports car was to be powered by the 4.2 litre, TVR Speed Six engine, together with the TVR Vortech supercharger, developing 580 bhp and 467 ft/lbs of torque, with a top speed of 215 mph, and a 0-60 mph time of 3.6 secs. The Typhon used a steel space frame chassis, reinforced with aluminium honeycomb sections, with an integral steel roll cage, and a floor pan made of carbon fibre. In this way, the weight could be kept to around 1100 kg. The cars were fitted with 322 mm vented discs at the front, and 298 mm at the rear. Initial testing of the supercharged engine produced an output of 600 bhp, which exceeded the original specification of 500 bhp. The Typhon's steel chassis was originally designed for racing using computer aided design software, and was the first TVR to use such a technique. Another first was the addition of adjustable dampers as standard to maximise the car's handling abilities. The Typhon was fitted with two intercoolers, a Tuscan S gearbox as standard, carbon fibre seats covered in leather, air conditioning, no traction control or ABS, limited slip differential, and a front splitter. Prior to delivery of the Typhons, Peter Wheeler sold the company, and so further work on both the race cars, the T440, and Typhon was brought to a standstill. During 2005, TVR said excessive heat from the supercharger had caused delivery delays, but this was likely to be just a story to cover up the deepening financial difficulties of the company. Originally priced at £85,000, by 2005, when production of the Typhon ended, the price had risen to £135,000. In reality, the Typhon had cost far more in terms of labour and development costs than had been anticipated, and was why production after 2004 was halted. However, in 2007, interest in the Typhon concept was reawakened, and work began on a much simpler to build 2+2, supercharged equivalent model to the Typhon, called the Typhoon. Unfortunately, by this time, the company was in desperate financial straits, and so progress on this model never materialised. 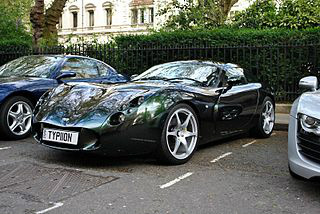 Apart from the Cerbera Speed 12, the TVR Typhon sports car was probably the fastest sports car produced by the company.